Job Interview Questions: Are You Nice? Job Interview Question: Are You Nice? In an article for the New York Times, Andy Lansing, president and chief executive of Levy Restaurants, said that he begins every interview with the question, "Are you nice?" Part of the reason he asks this question is that it startles many interviewees, who are not expecting to receive a question of this nature. I know one applicant who was caught off guard - during an interview for a teaching position at a challenging charter school - when the principal asked, "You seem like a sweet girl. How could someone so nice be able to deal with students acting out?" She said it was the hardest question she's ever been asked during a job interview. It’s not an easy question to answer because there is such a thing as being considered too nice. Unfortunately, being nice can be considered a detriment as well as an asset. Companies don’t always want to hire the nicest people for tough jobs. Should You Be Nice - or Not? When an employer asks you this question, he or she wants to see not only how you answer an unexpected question, but also whether or not you will fit into the company culture. It's a tricky question because sometimes the company wants to hire someone nice, and sometimes they don't. Here are some tips on how to handle the interview question, "Are you nice?" so that you will not be caught off guard. Sometimes, employers will ask you this question because they want to hire 'nice' people. If this is the case, the best way you can respond is to provide a personal anecdote about a time you demonstrated 'niceness' at a previous job. There are many kinds of 'niceness': being compassionate toward others; being a team player; being respectful of your boss or your staff; etc. Think of the job at hand and what kind of expressions or manifestations of 'niceness' would be important in that context. Then provide an anecdote about how you have demonstrated that kind of 'niceness' in previous roles, and how it helped you to achieve something at work. Yes, I do think of myself as nice: I consider myself to be compassionate toward others and I'm always willing to help others. For example, while working on a complex team project, one team member was frustrated and having trouble completing her tasks. I worked hard to complete my tasks ahead of time so that I could then help her. I listened to her frustrations and helped her to come up with a solution. My niceness thus helped our team to complete the project successfully. I consider myself to be extremely nice, which helps me to be a more effective leader. For example, whenever my staff members struggle with their performance, first I sit down with them and listen to their concerns. Then I work with them to come up with a solution to improve their work. I believe my compassion is what has led my previous employees to achieve consistently high sales numbers. 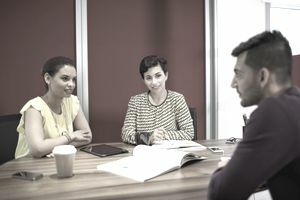 Sometimes the interviewer does not want you to say you are nice; rather, he or she might need an employee who is competitive or can firmly set high expectations for employees. If this is the case, personal anecdotes will once again help you to answer the question. Even if the interviewer is looking for someone who is not 'nice', you still do not want to provide lots of examples of how you are mean, nasty, or uncooperative. Rather, provide an example of a time when your firmness with an employee or colleague helped to improve his or her performance. For example, you might describe a situation where you needed to intervene with an under-performing employee by establishing a plan for improvement, and perhaps you eventually persuaded them to move on or fired them. You can balance this response by emphasizing that you are still a cooperative employee and that you listen to your colleagues and staff members. It will demonstrate that you are driven and firm, but that you are also fair and reasonable. While I am known to be understanding and cooperative, I am also known for being firm and setting high expectations for my employees. For example, I recently dealt with an employee who consistently turned in reports late and incomplete. After meeting with him to discuss how he could improve on his reports, he still failed to meet my expectations. Eventually, I fired him. While this was difficult, it was ultimately the right decision for the company and even for the struggling employee. I value being fair but firm over being 'nice' in the workplace. Based on the job description and the interviewer, you can usually tell whether or not the interviewer is asking you this because s/he is looking for nice employees or firm and tough employees. However, if you are unsure what the employer is looking for, provide an answer that demonstrates your ability to be both compassionate and firm at work. One anecdote that describes your niceness and one that describes your firmness will show the interviewer that you know which situations call for kindness and which require a more assertive approach. Remember that the interviewer will ask you this question because he or she wants to make sure you will fit in with the company culture. So, if you are offered the job, think carefully about whether the company environment is the right one for you. If you are a genuinely nice person and the interviewer says s/he wants employees who are not nice, you might want to think twice about taking the job. You may not be comfortable working in a negative work environment. The question "Are you nice?" will help both you and the interviewer to decide whether you are a good fit for the job.